Whether we talk about a commercial, industrial or residential property, every building’s roof has a certain lifespan, beyond which it becomes an eyesore, dangerous, leaky, and beyond repair. 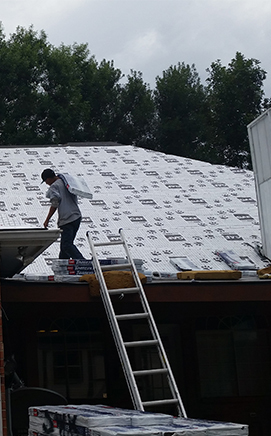 We, at Triumph Roofing and Construction, understand the urgency that comes with roof replacement requirements. Our re-roofing experts first conduct a comprehensive survey of your roof to provide an efficient and organized replacement option that fits your budget, business priorities, and energy concerns, among other considerations. Since inception, we are known for delivering cost-efficient and eco-friendly re-roofing services for virtually all types of roofs. Your roof needs repair/replacement if it is leaking, has more than a few missing shingles, is developing cracks, or is compromised with algae or age. If you see any such symptom, it is time to consider replacement. Moreover, if your roof is badly damaged due to natural phenomena or an accident, re-roofing is no longer a matter of choice. Our experts specialize in assessing all types of damages and provide comprehensive advice on the way forward. We design and execute the entire project with an acute focus on ensuring that the new roof provides the best in terms of lifespan, energy efficiency and appeal.